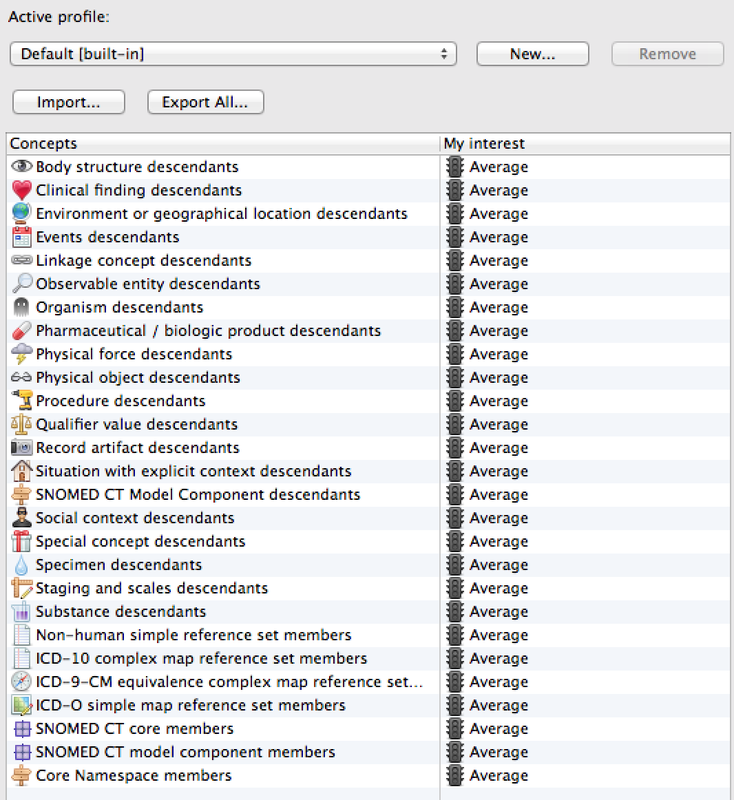 Snow Owl has been designed to make searching for concepts as simple as possible. The quick search box in the toolbar allows searching through all terminologies from a single location. It can also be accessed by pressing CTRL-4 (Windows) or CMD-4 (OS X). Search results appear progressively with each character typed further refining the search. The results are listed in different provider sections (e.g. 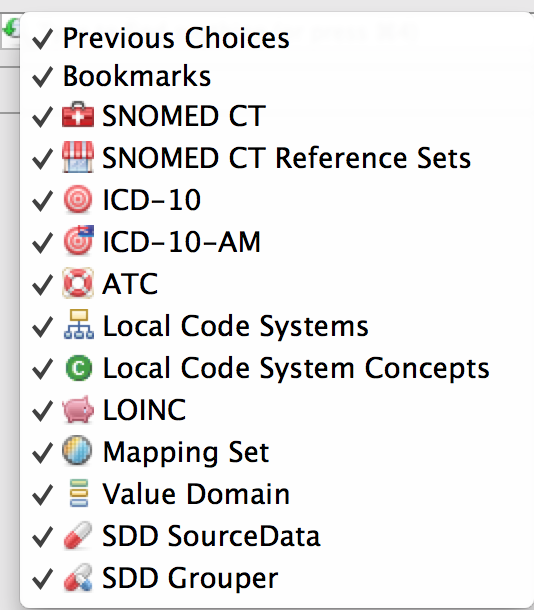 Previous choices, bookmarks, SNOMED CT, ATC) making it easy to identify their origin. Matches are highlighted to visually indicate similarities between the result and the search term. Approximate matches are displayed in grey font. Expand the search window (by dragging the corner) or press the shortcut (CTRL-4 on Windows ; CMD-4 on OS X) to see additional results. Click a result on the list to open the editor and review the concept or code. When searching for a concept using multiple words, it's usually much faster to type only the first couple characters of each word. For example, if looking for the "Allen cognitive level screening score", just type the first letters "al co le sc". You can also change the order of the characters (e.g. le co al sc). It's also helpful to rely on the usage frequency data when searching for commonly used concepts. For example, since you probably know that Diabetes mellitus type 2 is a frequently used concept, you can simply type 2 to display it as the first match. The quick search also works for searching by concept ID. There ID must be an exact match to be displayed. You can adjust your search profile. The quick search widget is also used in the entry fields of the concept editor. For example, when defining new content the results displayed in the entry field are constrained by the concept model. This way, only valid values can be selected. In the example below, the entry is constrained to valid concepts used in the 'Has formulated route' property. For more information, please refer to the editing section. Once you start typing you will see a suggestion to complete your current term appear in light gray. Press the tab key to accept this suggestion and update the matching results. The suggestion takes into consideration your previous choices, bookmarks, search profile, concept frequency of use data, mappings, and more when making an autocompletion recommendation. Multi-word terms can be queried by entering the first characters (see screenshot). The search automatically expands to correct potential spelling errors and identifies inexact search matches that the user may have intended. These results will appear as gray in the search results window to indicate that they are approximate matches. Spelling mistakes, different dialects, variant word forms, and more are included in the approximate results. Global history and frequency of use data increases the search relevancy. You can adjust your search profile to increase the relevancy of terms. Term location also influences scoring of partially completed search terms. For example, searching for "en co or" will prefer matches that start with terms in this order. 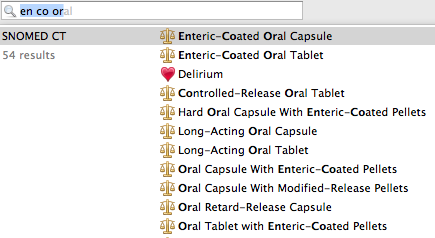 In this case, the first two matching results are "Enteric-Coated Oral Capsule" and "Enteric-Coated Oral Tablet". If there are more results than can be displayed on a single screen, only a subset of the total results appears in each of the provider sections. Drag the corner of the the search results window to increase its size and see more results. If you want to keep the size of the window, press the shortcut (CTRL-4 on Windows ; CMD-4 on OS X) to see additional results. Each time you hit the shortcut, more results will be displayed. By default, all search providers are included in the quick search. If you want to omit providers that you are not interested in, right-click the quick search icon in the toolbar to uncheck items that should be excluded. Users can use built-in profiles, or create a new profile based on a built-in one. Additional rules can then be added to bias the search results as desired. Matching search results are ordered according to the search profile preference settings. Frequency of use data is also considered when ordering the results. The relevance of concepts can be increased or decreased. For example, if you increase the relevance of "Clinical findings", search results in this hierarchy will be displayed higher in the list. It's also possible to exclude concepts from the search results. If you want to restrict your search results to terms that are relevant for humans, you can set your search profile to exclude members of the "Non-human reference set". Concept groups can be specified by hierarchy, reference set memberships, subset memberships, inclusion in simple and complex maps, and by both namespace and module. 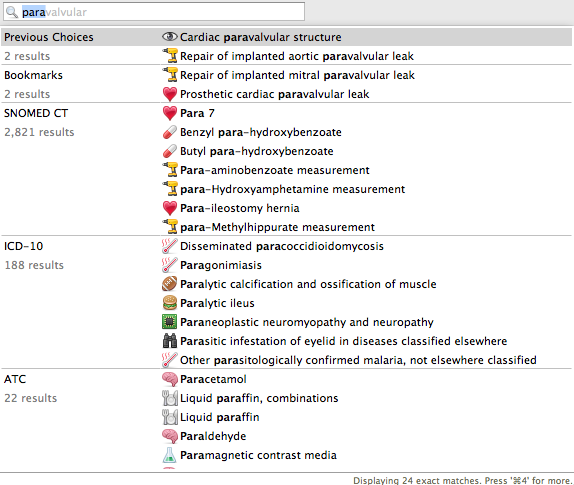 Results for particular specialties or departments can be prioritized (e.g. members of the cardiology reference set). Import and export allows profiles to be saved and shared with others. If your organization provides a reference set of concepts for your organization, department, specialty, or role, you can incorporate this into your search profile as well. 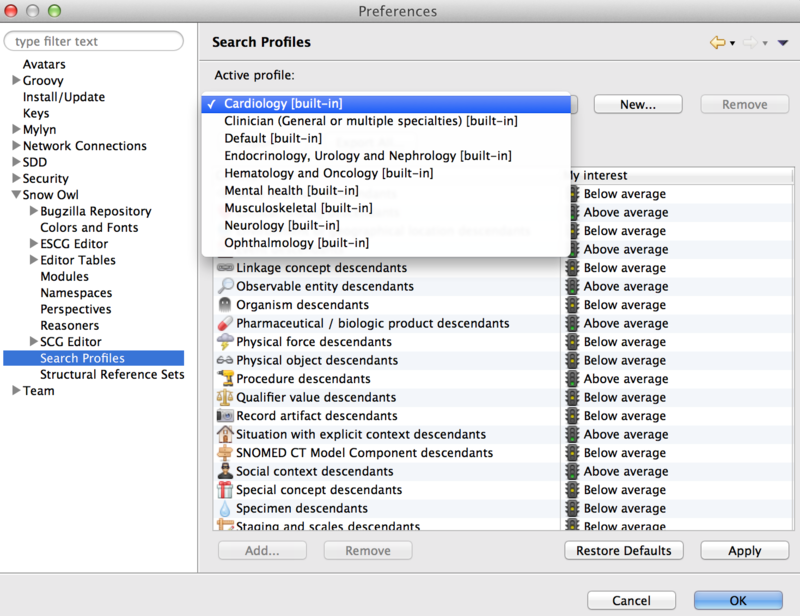 The Search Profile Preference page can be opened at File > Preferences > Snow Owl > Search Profile. In the default search profile all items are set to average. The relevance of search results is based on global usage frequency, and not biased by the search profile. Since all the settings are equal, this profile is also a useful starting point for creating your own profile. Hierarchies with clinically relevant terms are set above average (e.g. Clinical findings, procedures). 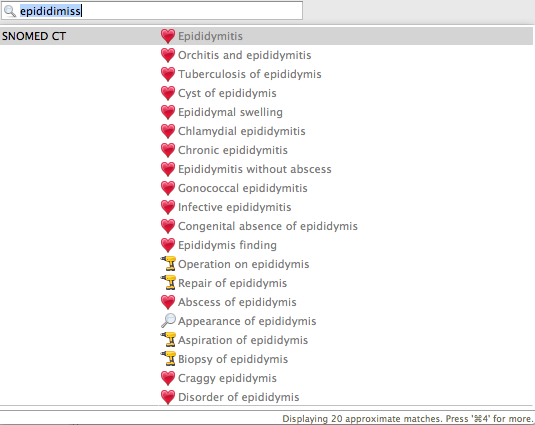 Members of the Cardiology reference set and the ICD-10 complex map are also set above average. Members of the non-human reference set are excluded. Hierarchies with clinically relevant terms are set above average (e.g. Clinical findings, procedures). 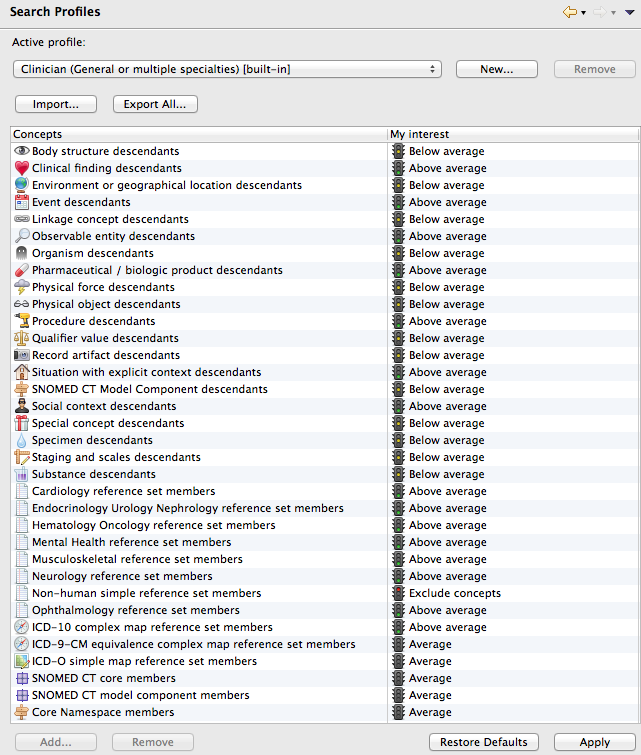 Members of reference sets for clinical specialties, and the ICD-10 complex map are also set above average. Members of the non-human reference set are excluded. Hierarchies with clinically relevant terms are set above average (e.g. Clinical findings, procedures). Members of the endocrinology-urology-nephrology reference set, and the ICD-10 complex map are also set above average. Members of the non-human reference set are excluded. Hierarchies with clinically relevant terms are set above average (e.g. Clinical findings, procedures). 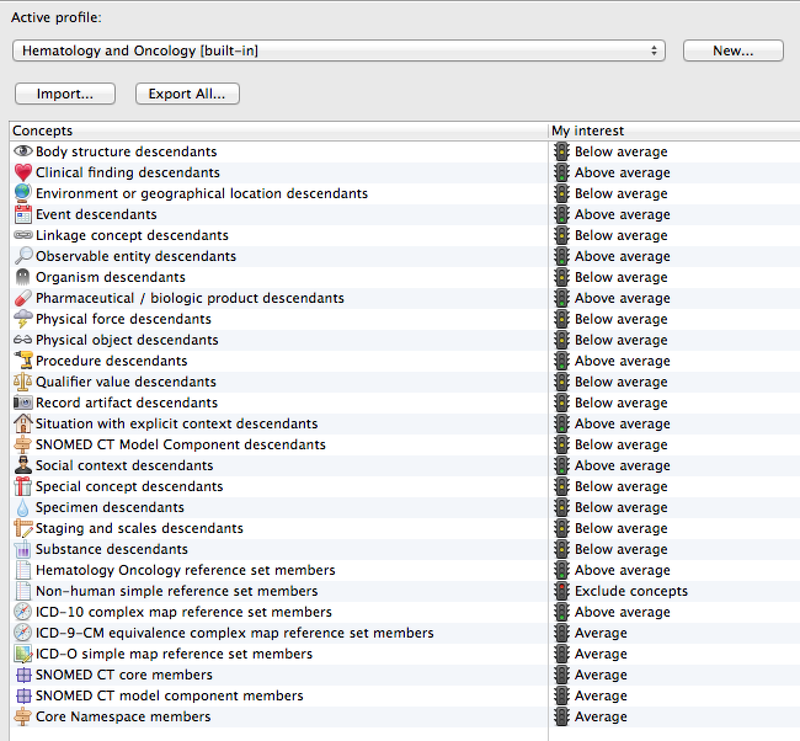 Members of the Hematology-Oncology reference set, and the ICD-10 complex map are also set above average. Members of the non-human reference set are excluded. Hierarchies with clinically relevant terms are set above average (e.g. Clinical findings, procedures). Members of the Mental health reference set, and the ICD-10 complex map are also set above average. Members of the non-human reference set are excluded. Hierarchies with clinically relevant terms are set above average (e.g. Clinical findings, procedures). 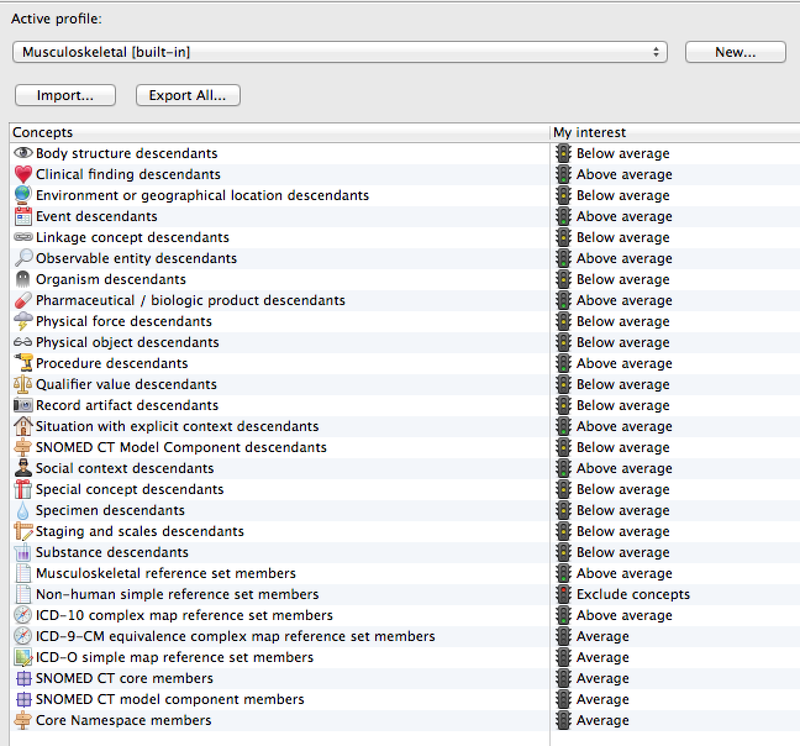 Members of the Muscoloskeletal reference set, and the ICD-10 complex map are also set above average. Members of the non-human reference set are excluded. Hierarchies with clinically relevant terms are set above average (e.g. Clinical findings, procedures). Members of the Neurology reference set, and the ICD-10 complex map are also set above average. Members of the non-human reference set are excluded. Hierarchies with clinically relevant terms are set above average (e.g. 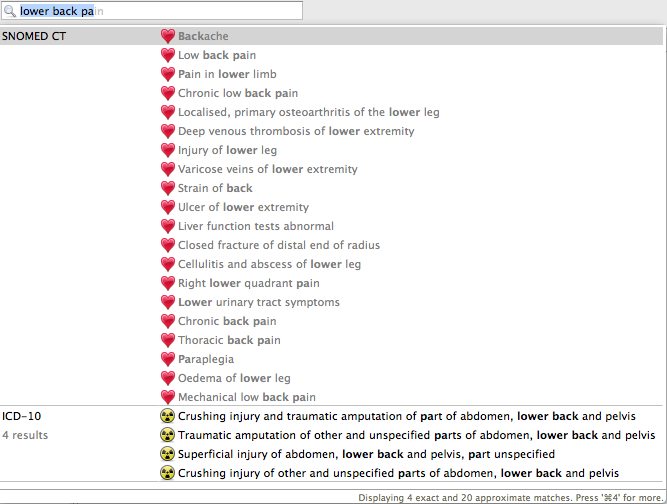 Clinical findings, procedures). 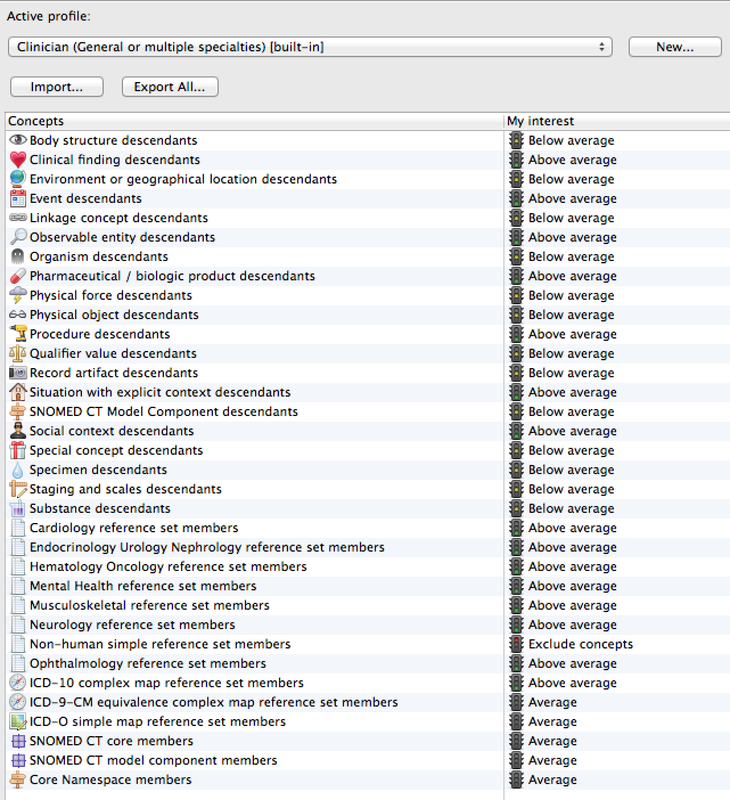 Members of the Ophthalmology reference set, and the ICD-10 complex map are also set above average. Go to "Active Profile" and select a search profile from the drop-down list. Now the ranking of quick search results is based on the specialty you selected. Choose a built-in profile as a base. Click Apply to update the search ranking, and OK to close the dialog. Use Restore default if you want to undo the changes. 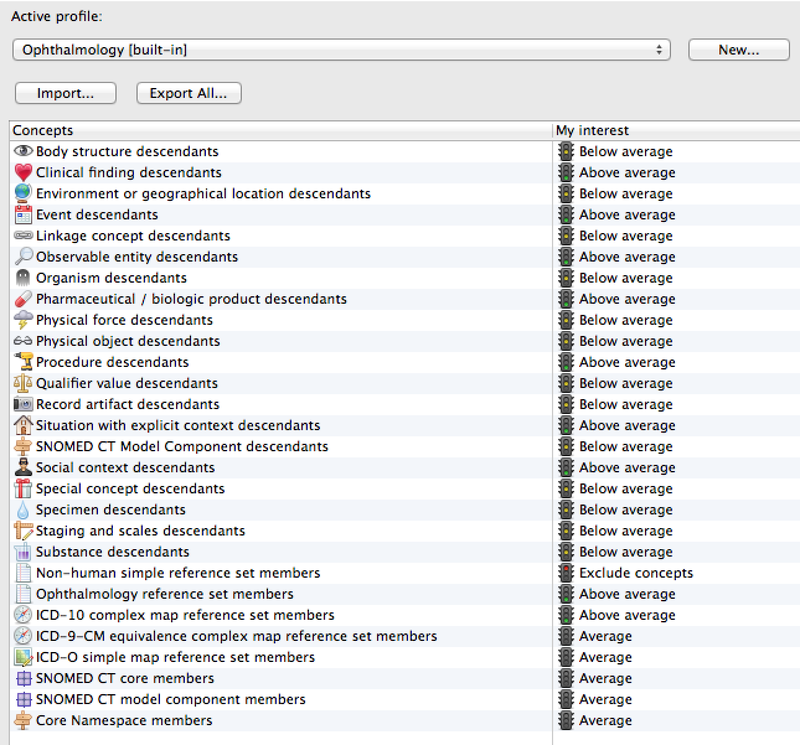 Concepts, reference sets, modules, maps, and name spaces can also be added to the new search profile. Click in the entry field to bring up matching items (see screenshot below). Adjust the ranking of the selected item if necessary, and click OK to proceed. Search profiles can be imported or exported as .xlm files. 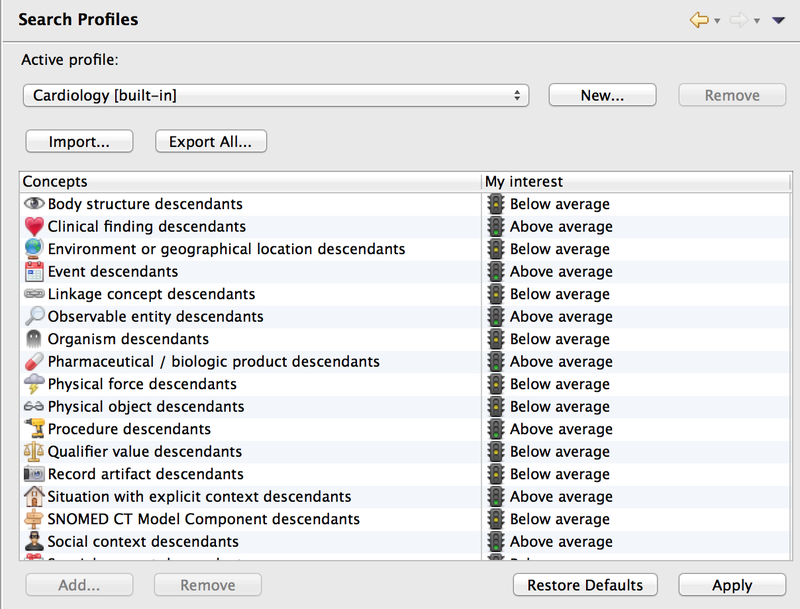 To remove a custom-built profile, select the profile in the drop-down list and hit Remove. Please note that built-in profiles can neither be changed nor removed. If you want to modify an existing profile, use it as a base when creating a new one. 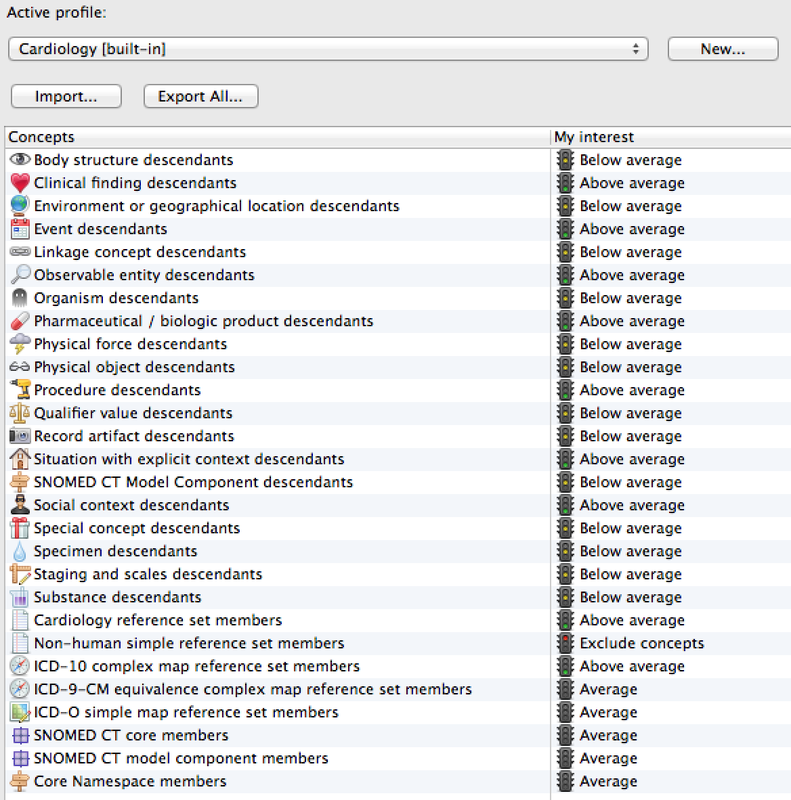 The automap feature uses the active search profile to identify more relevant suggested mappings. 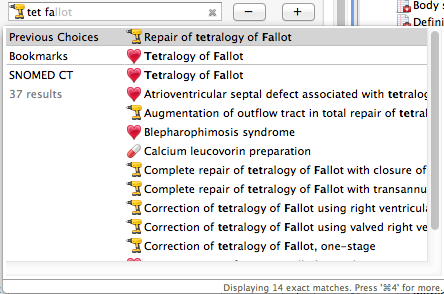 For example, if you're mapping an in-house list of cardiology codes, you can activate the built-in Cardiology search profile (Preferences > Snow Owl > Search Profiles > Cardiology) to increase the relevancy of the matched terms. Read more about automapping.